That pre-season was now complete and the cup tie at Port Vale had been successfully negotiated. We were now ready for the league season which got underway with the visit of Bolton Wanderers and their cast of characters from the bible. It was a later start than usual to the season because of the London Olympics. One day before the Bolton game I was invited to Gawthorpe where I saw the last half an hour of training. The players were getting on with things quietly but I did get the chance to ask Eddie Howe what the team was. He wouldn't tell me but did say there was one change from the team that had won at Vale Park. I was aware that Junior Stanislas had been singled out for criticism after that game so suggested the change might be Martin Paterson for Stanislas. I put that to the manager who said: "I can see why you think that, but that's not the change, he said, adding: "I want my best players on the pitch." The change did see Paterson come in but he replaced Brian Stock who had made an impressive debut in the cup tie. It was a surprise given the importance Howe had placed on his signing. Before departing for the Turf the news came that young central defender Kevin Long was packing his suitcase again and this time his trip was somewhat more long haul. He'd previously had loans at Accrington, on three occasions, and Rochdale but was now going to Howe's old club Portsmouth where the chaos was getting greater by the day. As for us, I don't think the season could have got off to a better start. 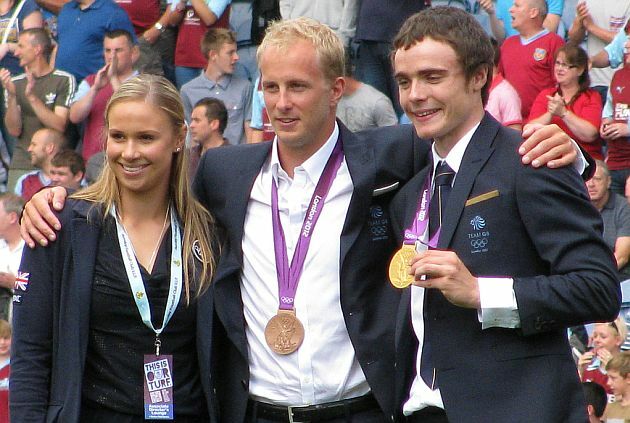 Clarets Mad Youth Foundation presented a cheque for £10,000 to new joint chairman John Banaszkiewicz ahead of kick off just before three of our Olympians, including gold medallist Steven Burke, took the applause from the Turf Moor crowd. Never mind all that, what made it the best of starts was getting all three points, made even better because of visiting manager Owen Coyle who clearly did not like the abuse he received, and he certainly didn't take kindly to the overhead plane with the 'Judas Coyle You reap what you sow." or the two lads who had tickets just behind his dug out, one wearing a t-shirt with JU in big letters and his mate with DAS on his. Coyle saw Paterson score the opener. Two efforts had been blocked before the ball finally broke for Charlie Austin to head across for Paterson who headed home. All the Bolton hands went up for offside and, needless to say, Coyle joined in after the game despite being perfectly aware that Martin Petrov had played our players onside. Austin added the second after the break to complete a 2-0 win, and a deserved win at that. We had played really well and got the season off to just the sort of start we needed. Three days later and we were on the road again for a league game for the first time since the Blackpool debacle at the end of the previous season. At some stage during a season you get caught up in traffic problems one way or another and we were hit with this first trip to Middlesbrough, diverted via the A1 and A66 when the A19 was closed due to a vehicle fire. The detour at least gave me my first ever view of the previously named Reynolds Arena in Darlington and the coach still made the Riverside in good time. Burnley fans arriving at the ground were learning that Paterson, who had played so well on his return from injury in the win over Bolton, was out of the side. Howe explained afterwards that he'd just felt some tightness in his hamstring. Sam Vokes came in with Shay McCartan taking up the place on the bench, and we were soon showing the sort of form that had won the first game. It was a start that should have been the catalyst for a win but we missed a couple of chances to get ourselves in front. When we finally did, with Austin heading in a Kieran Trippier cross, we were only able to hold the lead for thirty seconds as Middlesbrough drew level with a shot from outside the box. There is no doubt that we should have been in front by half time but the second half saw a turn around in our form that was to run for the next few games. Even so, but for Middlesbrough's remarkable ability to score with some stunning strikes, we'd have come home with something. They took the lead with 11 minutes to go but we got ourselves level four minutes from time with Junior Stanislas scoring his first ever Burnley goal. Had the assistant referee been doing his job he would have flagged Chris McCann's effort as having crossed the line. He didn't, and thankfully Stanislas was there to make it 2-2. Incredibly, another stunner two minutes later and Middlesbrough had won it and so we went to Huddersfield on the following Saturday looking to put things right. The only good fortune here was getting up to the turnstiles just before the torrential downpour that left several Burnley supporters soaked to the skin. They, like me, had to watch a shocking display from the Clarets. We lost 2-0 and could have absolutely no complaints about the result. We were just simply appalling against a Huddersfield team that, enthusiasm apart, had little to commend them. They fully deserved this win, no doubt about that. Things weren't to improve in the next week either. We won through in the cup against Plymouth on penalties. It was another poor performance and four days later, as Brighton came and won 3-1, we were no better. I know there were only four games gone but we were now in the relegation positions as we went into the first international break. Just ahead of the Brighton game, Howe had strengthened his options with the signing of Hull's Cameron Stewart in a loan deal that would run until January and he came straight into the starting eleven. We also learned that day that our next COCUP opponents would be Swindon at the County Ground. Peterborough were our first opponents after the break. We could never have predicted what would happen between then and the next international break in October. In just seven games we scored 17 goals, conceded the same number, and saw our manager decide it was time to leave. The Peterborough game saw a real change in fortune. Our opponents were still looking for their first point of the season and it wasn't hard to see why, so bad were they. Howe had ditched new signing Stewart with both Edgar and Bartley. All three were on the bench in a game we won 5-2. Having gone in front through McCann, we then managed to lose our way completely. We went 2-1 down and but for a goal line clearance by Joseph Mills it would have been 3-1. A few minutes before half time we drew level. The goal was, rightly in my view, credited as a Michael Bostwick own goal, after he turned in an Austin shot but the events of the second half persuaded our club to get that detail changed. Those events were Austin scoring twice more, once from the penalty spot, with Stanislas grabbing a fifth. That switch of goalscorer got Austin his second Burnley hat trick and it got Burnley a second league win of the season. It was back on the road for the next three games in which we had mixed fortunes. Without the injured Austin we led 1-0, and deservedly so, at Leicester where Dean Marney scored. Stock got his first league start in this one and both Edgar and Stewart were recalled, Edgar coming in for the injured Michael Duff injured with Wallace again left out. Just as at Middlesbrough, we let it go in the second half. Leicester were level within two minutes of the restart after some poor defending from Edgar and then got a fortunate second to win the game. We'd gone there to play a defensive game but in the end Leicester were probably deserving of the win after the second half performance from us but on the following Saturday it was us celebrating coming back from a goal down to win 2-1. The result at Derby was the same as in the previous season and the scorers were the same with both from Austin. The winner came right at the end but how on earth we won this one I'll never know. We were under the cosh for the last half hour at 1-1 but somehow didn't conceded a second and then, so against the run of play, got the winner. That was a third successive win at Derby. It was back to the cup. Brian Jensen's heroics in the penalty shoot out had seen us through against Plymouth and he was again in goal at Swindon. This time he didn't play well. He was at fault with one goal and very much to blame for the crucial third as we went down 3-1. Having said that, this was another shocking performance from Burnley. There was the first sign of real discontent aimed at the manager from the away section but most eyes were on home manager Paulo Di Canio who, frankly, behaved like a complete idiot. Two remarkable games followed at Turf Moor. The first of them against Millwall found us behind in under three minutes but that proved to do no more than lift us. Ben Mee headed home his first Burnley goal and two minutes before half time a superb Austin header from the edge of the box took us into the interval in front. On top in the second half we scored again through Stanislas. Earlier in the move Paterson had looked suspiciously offside but the flag stayed down. Incredibly, referee Craig Pawson then went to speak to the assistant and over half a minute after the goal had been allowed he astonishingly raised his flag. The game changed after that in Millwall's favour with the inevitable equaliser coming from Darius Henderson, so often a scorer against Burnley, in the third minute of stoppage time. Howe targeted the referee after the game, pointing to what he believed were two blatant penalties refused in the first half as well as the disallowed goal of which he said: "The delay absolutely killed our players and it was a huge psychological barrier for our players to deal with." It wouldn't be the last time a Burnley manager would point at refereering decisions going against us as this particular season unfolded. On the following Tuesday came an even more remarkable game against Sheffield Wednesday. Three times Austin gave us the lead and three times Wednesday equalised and on two occasions they did so within a minute. This time Howe told his players to start toughening up as more points were lost. You sensed all was not right and it was all to come out within the next few days. By the time we got to Crystal Palace there had been another managerial sacking. This time Bournemouth had dispensed with Paul Groves with Howe immediately installed as favourite. It just didn't make any sense. He'd walked out of this club to come to Burnley and there didn't seem to be any logic to it at all. At Palace, goals from McCann and Paterson gave us a 2-0 lead. It was astonishing. We were second best and yet 2-0 up in the first half hour. By half time it was 2-1 and the concensus in the away section then was that it would be a major battle to get anything from this game. With a quarter of an hour remaining we were 4-2 down and not even an Austin goal could dampen the criticism from the away fans that day. If there was discontent at Swindon then it was far more than that at Selhurst Park. The game ended 4-3 to Palace, a team that had just started to find some form after a poor start that had seen their manager Dougie Freedman under threat but this was the first time I'd heard any real cries for Howe to go. After the game the manager slammed his side publicly after such a poor performance. He admitted that there was only so long you could continue conceding goals at the rate we were and said that the work would be stepped up on the training ground and he would consider moving into the loan market. He said: "We changed system today to try and be tighter, but at 2-0 up we got hit on the counter attack twice, which was really disappointing with the system we lined up with. "Defensively we are switching off and losing concentration and we just haven't got the right mentality at the moment." On the way home I received a phone call that left me believing we would be searching for a new manager very soon. As the next week came it all unfolded. We initially refused Bournemouth permission to speak to Howe and said any approach was unwelcome. The time had come. 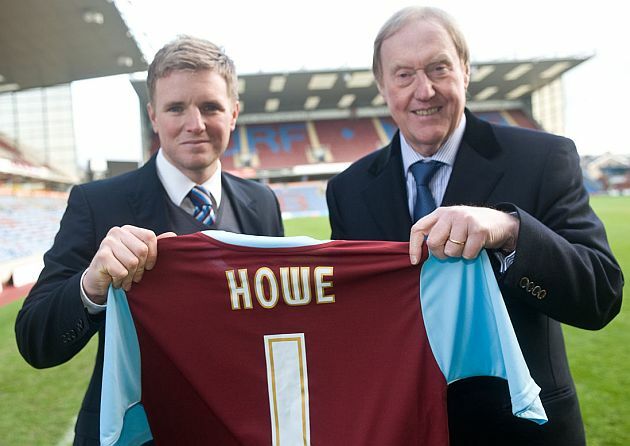 By Wednesday evening I wrote that Howe was edging closer to Bournemouth. By Friday his departure had been confirmed and he was appointed as manager of Bournemouth on Saturday 13th October. Only three teams - and they were Sheffield Wednesday, Ipswich and Peterborough - had less points than us and strangely we had the highest goals for column and also the highest goals against column. There were eight days before the televised Blackpool home game. Would we have a new manager in place by then? The recently sacked Bolton manager's name was immediately one of those mentioned.